Many people are dedicated to sourdough but are not quite sure how to "translate" their favourite recipes into sourdough recipes. One lovely reader, Charlotte, sent the following message and photo to us having found and baked the sourdough hot crossed bun recipe on the website. I just wanted to let you know that after many failed attempts at bread, I have just produced truly beautiful sourdough hot cross buns. I am THRILLED! What a treat! Thank you so much for your excellent recipe and all round good work. I would kiss your face! I will try again with the bread... my starter is more mature now and perhaps I have turned a corner with my technique. At least I will always have sweet treats to fall back on! Have attached pics. My edit includes earl-grey soaked sultanas + peel, plus fresh orange and orange zest (because I was eating / juicing them anyway) with a golden syrup glaze." Gorgeous Sourdough Hot Crossed Buns! 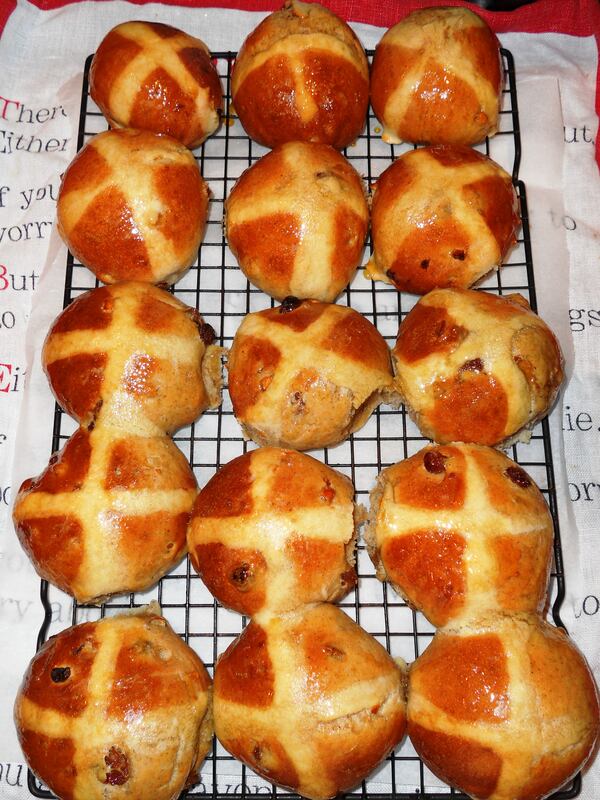 To find the recipe for sourdough hot crossed buns please click here. And if you would like to find more great, easy sourdough recipes, just search the site by typing "sourdough" into the search bar. Baking at the Clink where we cannot use yeast has led to the development of loads of great sourdough recipes, including loads for Italian bread (the head chef is Italian), and others such as sourdough Christmas Stollen, sourdough biscuits (scroll down, it's at the bottom) and more! So, have a click and a flick and you will find loads! If you would like to learn more about sourdough baking and how to fit it into your life, click here to find a course. We look forward to welcoming you! hi there, the dough IS very wet - it is the nature of bun dough (especially after you put in the soaked raisins). There is nothing wrong - just shape and bake - they are delicious! I have similar problems with the dough for sourdough loaves and generally end up adding extra flour. All tips for improving my technique gratefully received. What I do when rolling buns with sticky dough is to keep a bowl of flour to hand and actually pick up a handful of flour and squeeze it to get my palm lightly dusted. I also use a scraper to move the dough around to keep it off my hands and to move it around in whole pieces rather than have part of the dough stick to the counter and it all gets stretched out and is harder to manage. Where do you live? You may consider taking one of our sourdough courses. See here: http://www.breadangels.com/courses/ as they will certainly get you more confident with sticky dough.